I will be happy to assist you. Please post your questions or contact me directly at 781-934-1382. I have an old family genealogy from my deceased mother’s papers. My great-great-great grandfather is Dr. Rufus Hathaway. I also have a letter my grandmother wrote to her cousin about the Hathaway house she visited as a child. It also shows that our ancestry goes back to John and Priscilla Alden. I would like to update and verify the info I have. I’m a novice, could you give me some direction? Please email me at the archives at cravenscroft@duxburyhistory.org and we can discuss the Hathaway family. I have a large genealogical chart for the family going back to England. I also have many Hathaway letters in the Smith McLauthlin Collection. I am writing to inquire as to whether or not you have the diary of Captain Alexander Sampson in your holdings. 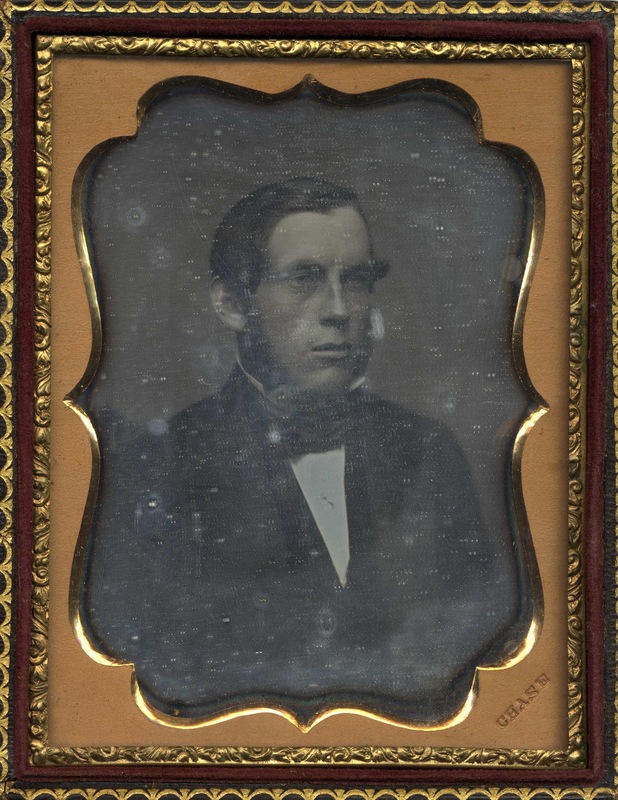 Alexander Sampson was asked to join Rufus Holmes and my great-great-great grandfather, William W. Winsor, in Port Angeles, Washington sometime around 1857-1859. While we know that Rufus Holmes returned to Duxbury and died there in 1893, I do not know what became of William Winsor after 1860, when he was a lighthouse keeper at Tatoosh Island, off of Port Angeles. His wife and daughters later moved to Cambridge, Massachusetts. I have been in touch with the reference librarians of the Clallam County Historical Society in Washington, and they do not have a record of William Winsor after he became the lighthouse keeper at Tatoosh Island. Captain Sampson wrote letters to his father back home in Duxbury and maintained a diary. I was hoping that his diary might be part of your holdings. The diary is mentioned in a June 13, 2001 article in the “Duxbury Clipper”, entitled “A Journey Down Surplus Street, Part III: Generations”. I am on a wild goose chase, triggered by the biography of Sarah Alden Bradford Ripley (daughter of Gamaliel Bradford) by Joan Goodwin. Joan Goodwin passed away in 2006 and all her papers have vanished. She had made transcripts of a vast number of papers of Sarah and Samuel Ripley’s family, which Goodwin had found in the barn of Frances Ames Randall in Duxbury (on the hunch of the latter’s nephew John W. Ames). They included letters of the Ripley and Thayer families all the way back to at least the 1810s. After transcribing the letters in the 1950s and then returning them to Mr. Ames, Goodwin lost track of the family. Now that her papers are gone, too, the “Duxbury” papers have disappeared twice. It’s hard to believe that such heavily borrowed papers would have ever been thrown out. My hope is that now with the internet, those original “Duxbury Papers” of Frances Ames Randall might be found. Do any of these names or papers ring a bell with you? I’d appreciate any leads you might have. My grandfather John J. McLaughlin or leased the land and built the last house on the end of Pine Point Rd. next to the Duxbury Association Beach on Gurnet Rd. back in the early 1920’s and sold it to Robert McLaughlin his brother. I found a record through the Plymouth Suff. County Registry of Deeds showing that Robert McLaughlin paid $10,000, to Alice Dutson; and Robert was my Great Uncle and Alice was my Great Aunt back in 1936. Then I found that the cottage was built in 1940 through the property records what I can’t find was when my grandfather sold it to my Great Uncle Robert McLaughlin. I am wondering if Duxbury may have it on file manually. Amazingly during all the Northeasters and severse storms all these years this is the last house still standing. In your archives can you locate such a deed or record of this for me. I’m looking for information about Capt. Parker Hall, whom I believe was born in Kingston, MA and may have died in Duxbury. He was my great, great uncle. You can contact my father, Richard West, he knows most about the family history. He can be reached at rwest53@gmail.com or 508-566-7352. Hi Louise, we also have a very large Parker Hall Collection here – many photographs and letters. If your father is ever interested in taking a look at the collection. My gg grandmother is Laura Loring, daughter of William Loring, Jr. who is the son of William Loring, Sr. and Althea Alden of Pembroke. I am interested on any info. or pictures. I have old bible records and pictures also. I have also recently discovered that the William Loring house in Pembroke is possibly going to be condemned. This house needs to be saved. Who do I contact? Please help. I am also a descendant of William Loring, 3rd great granddaughter of Arabella Loring Bailey (daughter of Ichabod Loring). I have pictures of the Loring houses on High street and happy to share. I would love to see the photos of the Loring house. You can reach me at cravenscroft@duxburyhistory.org. Thanks you! I am researching a certain person who immigrated to Brazil around the time of the civil war. Her name was arah Bellona Smith Ferguson. Is there any chance I can have access to texts, letters, records, etc. related to her and her story? I am not familiar with Sarah Bellona Smith Ferguson. Was she born in Duxbury? I do not believe the Drew Archival Library has any material relating to her. Thomas Hayward emigrated from England with his wife to Massachusetts on the ship Hercules of Sandwich in 1634. Reportedly, he and subseqent Hayward descendants lived in the same house in Duxbury for 140 years. Do you have information about the location of the Hayward home or other information about Thomas Hayward ancestors that lived in Duxbury? I am researching both the Hayward and Low families who were early residents of the Duxbury, Bridgewater, Plymouth areas. My wife and I are making a driving trip to Duxbury from our home in Fallbrook, CA (near San Diego) and would appreciate any information you can provide. Thank you, and look forward to your reply. I am inquiring as to what you may have in your Archives related to my ancestor Philippe de Lannoy who moved from Plymouth to Duxbury in 1634. I see you list information about his descendants Samuel DeLano Jr and Amas DeLano, But there seems to be so little out there about Phillipe other than how and when he came to Plymouth and then Duxbury. We have some Delano family information but nothing specifically created by or about Philippe. You may be interested to know that his original land grant is located directly across the street from the Drew Archives. Hi Jonne, I know this is coming a long time after your post, I hope you still get it!! I have a little information on the family I will have to dig out. I am also a descendent of Phillipe. There is a great website http://www.familysearch.org where you can do free research. Feel free to connect with me through email. I am a teacher from San Diego, California and am coming to Plymouth, Boston and Amherst to study this summer. While there, I’d love to access any records on the Covell side of my family. I’ve read on multiple genealogy websites that the first American Covell was an indentured servant to both Elder William Brewster and Peregrine White. Could you please please direct me to any resources? Thank you! I’m trying to find out historical information on 155 Bay Road and/or that general area of land across from Bayridge Lane on the Bay. Any suggestions for a starting point? I believe the original house was built around 1920. Thanks. You can start with old maps of the area. At the Archives I have census and assessors maps that give the names of homeowners. You can also see who owned the land before your house was built. If you want to if back further than your house, to the general history, I have resources here that can help you too. I may have an old photo of the property as well, that may take a bit of digging. Another tact is to research your deed at the Plymouth County registry, you can do much of that online. Thanks!! I will try to stop in in the next week or two. I have researched on the Registry of Deeds a bit and a lot of the info I found is confusing (to me). Probably best to start from the beginning and get the correct names from you so I’m sure I’m looking at the right documents. Thanks again for your fast reply! Hi Carolyn; I have just recently discovered that my 3x great grandparents were “inmates” of Almshouse in Marshfield Plymouth. Charles Bailey (1801-1880) He is listed in the census as a farmer at age 79 and died at the Almshouse in 1880 of “old age”. Survived by his wife Rachel Sherman- Bailey (1797-1882 Her parents were Icabod Sherman & Sarah Joyce) she died later there in 1882. I’m not sure if this is the place where they would have lived but it is listed in the Marshfield area? Where would I find out more information as to where they would be buried, what brought them to the Almshouse in the first place as they had a family etc…? His brother is also listed there George Bailey age 82 in 1880 and death is listed as “dropsy”? Not sure what that is. Let me know if there is a place I can find out about how they spent their last days etc… Thanks! I am very interested in the “Thomas Frazar Family Record” that you have mentioned in the “Frazer Family” page, under Section III. Is there anyway you can post the contents, or contact me about transcribing them for you? Hello and thank you for the fantastic website. I am very interested in Captain Jonathon Smith Jr. Have you a date of his death? We have a Captain Jonathon Smith of the Sea bird is recorded in shipping records in Melbourne Australia in June 30 1853.Do you have any information on this interesting sea captains life? Gerald, I deleted my earlier response – I was confused for a moment between Jonathan and Jacob Smith. Capt Jonathan Smith died in East Boston in 1863. He was only 39 but had been I’ll with consumption for a while, I think. We have a number of letters of his that may shed light on whether he was in Australia. I will take a look at the Smith McLaughlin Collection on Monday. You can email me at cravenscroft@duxburyhistory.org if you have any questions. I knew he had gone to San Francisco but not as far as the South Pacific. Unfortunately, the only letters we have in the collection written by Jonathan Smith are of an earlier date – 1852 is the latest and he writes of a shorter excursion, not one as far afield as Australia. There is a photograph of Jonathan Smith in this blog (https://drewarchives.files.wordpress.com/2010/03/smith001.jpg) as well as an article about the Point School at which he was a student. I did see by doing an internet search that a letter had been for sale on Ebay at one time, written by Jonathan Smith to his brother from New Orleans, aboard the Sea Bird – it was dated Nov. 1853. I’m not sure when it was for sale – but I wish we had acquired it! Thank you for your response. I am always looking for information on Phillipe himself, personal stories of his life. I have read Bradford’s few words about him and know as well about his relationship to Francis Cook and of course those things noted in records regarding his involvement in the community, his will etc……but there seems to be no knowledge about him personally…no life stories …that is nothing to reveal what sort of man he truly was as we see with so many of his contemporaries. And quite frankly there appears to be the same issue with those descended from him that I am directly related to…..Lt. Jonathon, Jonathan Jr., Jethro, Nathan, Richard, Nathan Stanley and even my own grandfather Orin Elsworth Delano! No written family tidbits to be found. I’ve always wondered if there might be an old family bible or two tucked away and forgotten for all time. Any ideas on the location of the summer home of the Sidney/Sydney Harwood family on Powder Point? I have one small reference to landscape design work done (or not done) in 1945. Demolished/extant? I’ve combed through census records (but, summer home, you know…). Any property maps of the area? Thank you in advance! Should be no problem. I’ll get back to you once I’m in the archives tomorrow. In the meantime, check the Plymouth Registry of Deeds online, you may find the deed there. Hello Is there any chance I can hire some one to get copies of letters of correspondence Duxbury Rural and Historical Society for me? contact me at cravenscroft@duxburyhistory.org and I can get the copies made and mailed to you for a minimal fee. I apologize for my bad typing today. I have been working with distant Drew relatives to find our mutual ancestor, Rev. John Drew, who is said to have been born c. 1759-60 in MA. He married Eunice Baldwin on 8 October 1792 in Lebanon, Grafton County, NH and died in Lawrenceville, Tioga County, PA on 15 February 1828. John Drew was ordained a minister in Hartford, Windsor County, Vermont in September 1789. We along with other cousins have been searching for John Drew’s ancestry for many years. We are uncertain of his parents. DNA results have not been helpful. Can you direct us to resource or documents on his parentage and ancestors? I live in Sacramento, CA. I found your website online today, and I have been looking through the information it contains. The Drew Archival Library is a very impressive archival resource. I am seeking any additional info regarding the Sprague & Soule Shipping Co. My grt grt grt grandfather(Jim Soule) was a shipmaster for them aboard Roebuck and Broosa (1849-59), but know little else. Any info appreciated. Hi Jim, I don’t know much about Sprague and Soule. Certainly two very old and popular Duxbury names. The owners of the firm were probably from Duxbury – especially given the town’s association with shipbuilding. But, as Sprague & Soule was a Boston firm, I don’t know anything about them. By 1849, when your ancestor sailed, Duxbury’s shipbuilding era was all but at an end and many of the people involved in the industry had moved to Boston. Hi again – I was wondering about your ancestor, Capt. Jim Soule. If it was the same Capt who was married to Mary Elizabeth Fuller, I am curious about what happened to her. I am compiling a list of all women who went to sea with their Duxbury mariner husbands and am wondering if her lack of death record and not showing up in the 1860 or 65 census records may indicate she went to sea with James – and possibly took Nicholas. It was quite common for wives to accompany their husbands at that time and take their children. Do you know if she was at sea? Looking for information on Sailors Snug Harbor. Organization moved out of the Germantown section of Quincy MA late 1947-48, when Quincy Housing Authority built veterans housing on the location. believe the remaining sailors were placed in an old home on Powder Point. Any information or leads for more information, can’t wait! The dormitory building at the Powder Point School for Boys became the Sailor’s Home. The building was torn down in the late 1970’s. I have sent a photograph of it to your email address.